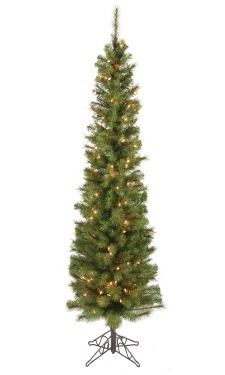 The Aspen Pencil Pine Tree is great for smaller spaces with its narrow profile. Features 3- piece hinged construction and dark green PVC mixed blunt tip needles. The medium green coloe, small pine cones and natural looking wrapped trunk add to its authenticity. Comes with incandescent mini lights and green metal stand. Size/Base 6′ H/ 22″ Dia.